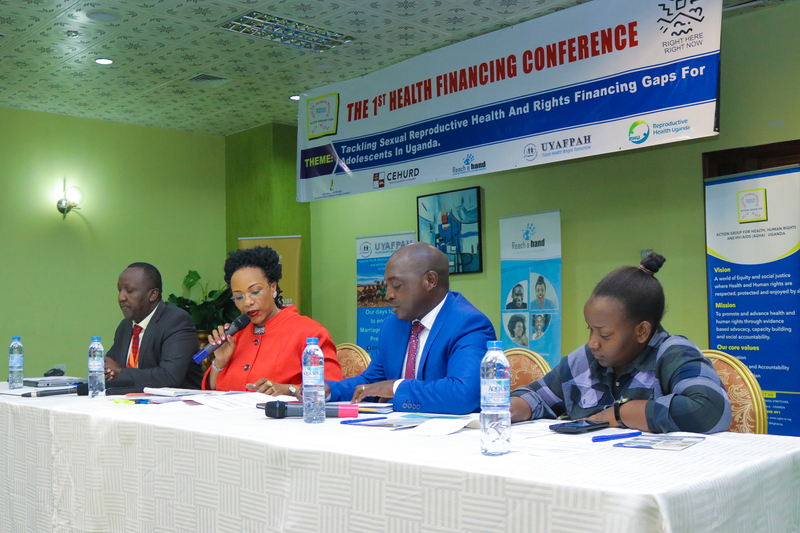 The health budget financing dialogue organised by Action Group for Health, Human Rights and HIV/AIDS and partners under the Right Here Right Now platform, was a more than thrilling experience. When the day’s first panel sat, all in presence in the Gardenia Hall of Imperial Royale Hotel were excited. Centre to it were Buyaga West Member of Parliament Barnabas Tinkasiimire and Amanda Banura, the country coordinator for International Youth Alliance for Family Planing. A discussion involving a member of parliament and a young person advocating for other young people, fruitful results could be expected. Amanda was first to place the status quo; in a country where sexual debut is averagely at 15 years, 3 in every 10 girls already started childbearing, high rates of unemployment and a number of other issues maiming the future of young people, we still have stifled right to provide reproductive health and rights information-as if we forget that this is a basic human right. The health budget is sidelined, at 1.8 trillion as of the financial year 2017/18. In it lies the smaller component of reproductive health. Yet the legislators in Parliament where Tinkasiimire sits are tabling a motion to have their salaries increased, and we are supposed to celebrate. This was well noted and applauded by the audience. It clearly didn’t add up that reproductive health got a paltry 3.8 billion, yet there are multiple funders willing to inject billions of shillings to improve it for Ugandans. It seemed that the government wasn’t paying enough attention, as it should. It was Hon. Tinkasimiire’s turn. His submission too was impeccable. He critiqued the entire debate of parliamentarians clamouring for increased salaries, basing on the fact that a representative of the people should not have their economic backbone hinged to a salary, especially when the salaries are rooted in the taxes of the people they represent. He emphasised his stance by calling upon people to send actual representatives not pretenders to parliament. He wrapped it up with calling upon the government to know when to spend, and to spend on items that they have budgeted for. In his opinion, un-budgeted expenditure would translate to government cutting allocated resources, and unfortunately sectors like health that are very important to Ugandans suffer. It was a learning experience, seeing that the views of a young person were in line with those of a legislator regarding health, especially that of young people. It re-echoed the fact that since our country’s population is youth dominated (77% of the population is below 30), it is more than a necessity that a significant amount of the budget should be allocated to the protection of their lives. That is how we tap into the large labour and creative force that they provide, to propel our country to better development levels. The move starts with having the budget considering the reproductive health needs of young people as important, and not as options. That was our lesson, and one we believe every Ugandan should take.